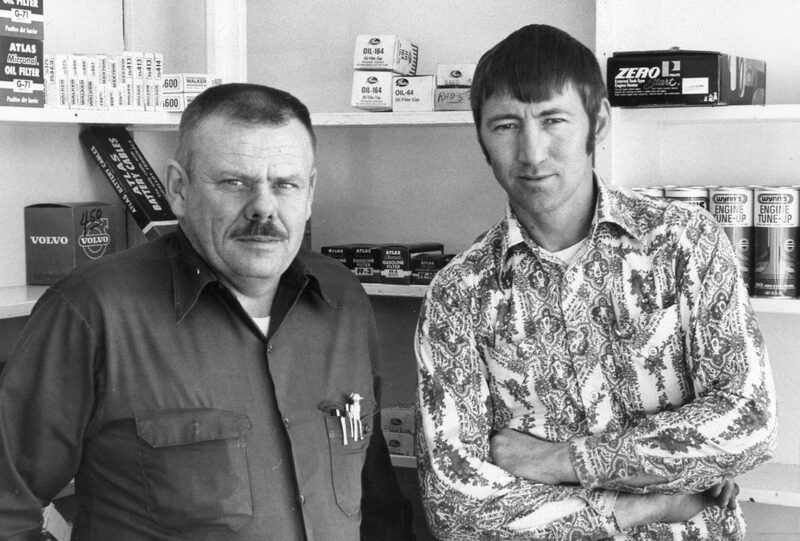 Valley Chevron Service Station owners, Ron Raschke (left) and Carl Chapman, pose inside their business at 317 W. Victory Way in 1976. The filling station was located where today’s Lube Plus operates. The only full-service gas station remaining in Craig today is the Conoco Station located at 140 W. Victory Way. Things are constantly evolving in our local landscape, especially from a business perspective, and it can be difficult to recall the many businesses and stores that have previously served our community. Service or filling stations, as gas stations used to be called, are a type of enterprise that has faded dramatically from the Craig scene over the past decades. The first gas pumps showed up in Craig in the mid-1910s to meet the needs brought about by the influx of motor vehicles into remote Moffat County. At this time the hand-operated gas pumps were usually found at livery barns or garages. After World War I gas stations dedicated solely to providing fuel and related automotive services began cropping up around the area. Even through the depression years, the number of automobiles continued to grow in this rural area. Though Craig’s population remained fairly static through the mid-20th century, the filling station industry in Craig flourished with the steady increase in motorized vehicles. By 1963 there were numerous filling stations serving the Craig population. The Museum of Northwest Colorado is hosting a contest to see if anyone can name all the gas stations that were in Craig in 1963. The first person to correctly name all the stations will receive a free book from the museum’s bookstore. Get your thinking cap on, and see if you can mentally traverse the streets of Craig, 50 years ago, and recall all the service stations operating at that time. The Museum of Northwest Colorado is located in downtown Craig at 590 Yampa Ave., and is open Monday through Saturday with free admission. For more information, call 970-824-6360, and meanwhile, take a mental trip around Craig in 1963 and see if you can remember all the gas stations in business then.